I’ve just been forced to sit through another vendor presentation that had a lot of talk about their “platform” and how successful it’s been, and how valuable it is. When I pointed out that their platform was dependent on at least three other platforms, there was pause. Silence. The sales team, clearly, hadn’t realised this and it wasn’t part of the vendor briefing. I told them, it’s “Platforms All The Way Down”. The Network is not a substrate, or a foundation, or a simple set of connections. The Network is a platform. Your Network is a platform in a similar way that other technologies claim to be platforms. Oracle is a database platform, MS Windows Server is an OS Platform, VMware is a OS virtualisation platform. HP Servers are a hardware platform. NetApp is a storage platform. The problem with most platforms is that vendors attempt to glamourise their value by pointing out all of the other technologies that depend on of their platform. Enter sales droids making great declamations about all those services and functions that sit on top of their platform while conveniently forgetting to respect, discuss or even mention the platforms that they depend on. For example, VMware is good platform for virtualisation that depends on Server Hardware platform, which in turn depends on the Network Platform. VMware makes many great announcement that software will change the way servers work while conveniently avoiding discussion of their poor networking features and limited hardware capabilities. Similarly, the Security Platform that combines many layers such as logging, IPS, and firewalls but also is completely dependent the Network Platform. Developers like to think that that their language is a platform. Database administrators think that their SQL platform is the foundation. Database platform that co-dependent on the application platform that supports the development platform that supports the business process platform. The problem is that for all platforms except networking, there is plenty of other platforms that support the other platforms. Networking depends on nothing else except the physical cabling and power in your data centre. Oh. See what happened there. In business, there are many companies that are building platforms. Platforms have great value (to investors) in terms of locking customers into a set of tools, or a process and make a great long term revenue source. Investors are very fond of companies that have “recurrent revenue models”. Obviously, customers should always be wary of buying into a platform because of the committed expenditure model they are taking on. 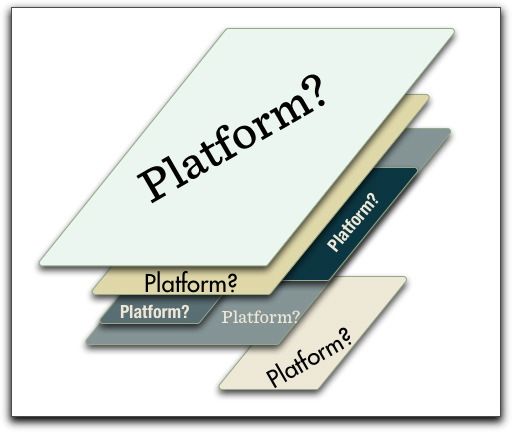 But for every platform, there is another platform that it depends on. Failure to recognise this dependency makes your platform weak. Importantly, engineers can see straight through the marketing double speak here because they have intimate knowledge of the stack and the interdependency. It’s just one point of tension between “positioning” and “reality”. Vendors and resellers should forget the “platform” and start thinking about ecosystems that are connected platforms all the way down. One could just as easily argue that networking is completely dependent upon OS and application platforms, as well as power and cabling. Because without operating systems and applications, the network itself has no value. Empty 10 Gigabit pipes aren’t very exciting. Oh My God. That tortoise thing almost sent me off my chair. Reminds me of the old lady who sat next to me on a bus home from University. We made small talk, she asked what I was studying and I informed her that I was majoring in computer science, which had just become a separate major from mathematics (Yes, I’m ancient) . Her knowing response: “Those computers, they’ll never catch on”. Nice one Nostradamus.